"Simple deliciousness, that's what this is. This corn salad recipe is one of my favorite summer side dishes. It's a perfect complement to just about any meat you pull off the grill, and can be dressed in countless ways. Serve at room temperature." Whisk mayonnaise, vinegar, 1/4 cup olive oil, garlic, water, 1/2 teaspoon black pepper, sugar, 1/4 teaspoon salt, Italian seasoning, and a pinch cayenne pepper together in a bowl until dressing is thick and creamy. Cover dressing with plastic wrap and refrigerate, 8 hours or overnight. Heat 1 tablespoon olive oil in a large skillet over medium heat. Cook and stir corn in hot oil until light golden brown and toasted, about 15 minutes. 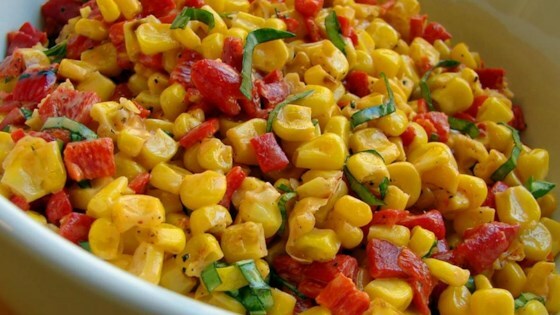 Mix corn and red pepper together in a bowl. Pour enough dressing over corn mixture to coat completely. Season with salt and black pepper. Stir basil and a pinch cayenne pepper into corn mixture; toss. The nutrition data for this recipe includes the full amount of the dressing ingredients. The actual amount of the dressing consumed will vary. Made exactly and felt the dressing had too much vinegar. After refrigerating overnight, the salad was exceptional. Will definitely make again with no changes. Very tasty salad, especially this time of year. Made it twice and will be making again. Excellent! I used frozen corn and the dressing is sooo good! A keeper for all seasons.